Western blot analysis of extracts from OVCAR8 cells, transfected with 100 nM SignalSilence® Control siRNA (Unconjugated) #6568 (-) or SignalSilence® Bak siRNA I (+), using Bak (D2D3) Rabbit mAb #6947 (upper) or α-Tubulin (11H10) Rabbit mAb #2125 (lower). 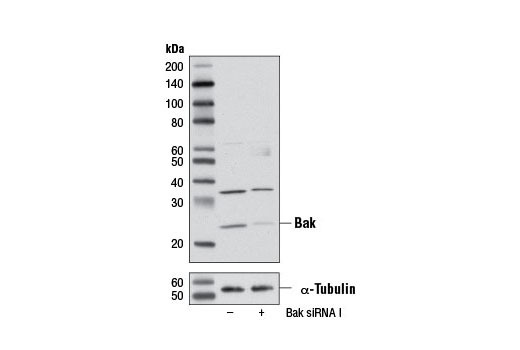 The Bak (D2D3) Rabbit mAb confirms silencing of Bak expression, while the α-Tubulin (11H10) Rabbit mAb is used as a loading control. CST recommends transfection with 100 nM Bak siRNA I 48 to 72 hours prior to cell lysis. For transfection procedure, follow protocol provided by the transfection reagent manufacturer. Please feel free to contact CST with any questions on use. SignalSilence® Bak siRNA I from Cell Signaling Technology (CST) allows the researcher to specifically inhibit Bak expression using RNA interference, a method whereby gene expression can be selectively silenced through the delivery of double stranded RNA molecules into the cell. All SignalSilence® siRNA products from CST are rigorously tested in-house and have been shown to reduce target protein expression by western analysis. Bak is a proapoptotic member of the Bcl-2 family (1). This protein is located on the outer membrane of mitochondria and is an essential component for transduction of apoptotic signals through the mitochondrial pathway (2,3). Upon apoptotic stimulation, an upstream stimulator like truncated BID (tBID) induces conformational changes in Bak to form oligomer channels in the mitochondrial membrane for cytochrome c release. The release of cytochrome c to the cytosol activates the caspase-9 pathway and eventually leads to cell death (4,5). Gross, A. et al. (1999) Genes Dev. 13, 1899-1911. Wei, M.C. et al. (2001) Science 292, 727-730. Zong, W.X. et al. (2001) Genes Dev. 15, 1481-1486. Degenhardt, K. et al. (2002) J. Biol. Chem. 277, 14127-14134. Wei, M.C. et al. (2000) Genes Dev. 14, 2060-2071.